The US-China aviation market has stagnated. For the first time in years growth will have come to a halt as of March 2019. The 12-month rolling average of capacity between the two nations will have stopped growing, according to OAG data. In a world where air travel growth typically follows economic growth because consumers tend to prioritise travel when they have a bit more disposable income, this is surprising. China’s economy may be slowing but by the standards of most countries’ growth of 6.3%, which is being forecast for this year by the OECD, is enviable. Meanwhile in the US, the economy is expected to grow by 2.7% this year, respectably above the OECD average. It’s not hard to attribute the cooling off in air services to the face-off taking place between China and America. But there are mixed messages. Capacity may have stagnated but airlines are still adding routes. There were 48 routes between the US and China being operated by direct scheduled air services in January, four more than January last year. New were Atlanta-Shanghai, Las Vegas-Shanghai Pudong, Los Angeles-Shenyang, Los Angeles-Xi’an, and Honolulu-Hangzhou, while San Jose-Shanghai was dropped. Airlines have been adding between four and eight new routes each year for at least the last five years, demonstrating the durability of these air services. Many of these have been between secondary Chinese cities and the US, and often operated by Chinese carriers as the American airlines have found it harder to make these routes work for them. United Airlines dropping of its Hangzhou service in October 2017 is a case in point. More recently American also dropped its services from Chicago to both Beijing and Shanghai, citing low yields from high volumes of connecting traffic. With little appetite to expand air services by the Americans, future growth may need to lie with the Chinese airlines. However, not surprisingly, a closer look at the country of origin for each booking i.e. the country where the first flight on an itinerary is located, shows that it may be Chinese travellers who are driving the current market dynamics. Overall traffic, or airline bookings, between the US and China for the most recent month available, November 2018, showed that traffic, like capacity, was flat. There were 0.1% fewer air passengers in November 2018 compared to November 2017. 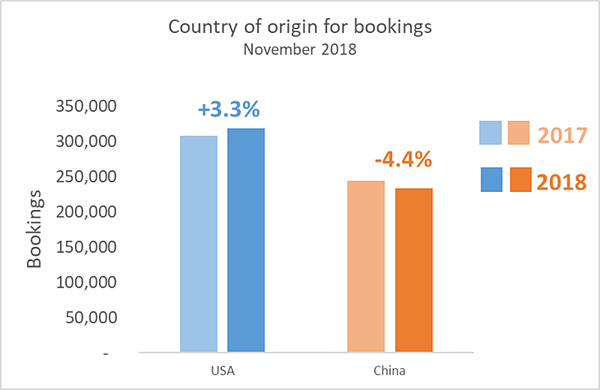 What is more, while passengers with a US point of origin, who made up 57% of all bookings, were up by 3.3%, travellers with a Chinese point of origin were down by 4.4%. This goes to show that while the industry rule of thumb which links air traffic growth to economic growth mostly holds good, politics can throw a spanner in the works.